The top two goal scorers in the NHL may not be on the ice when the Stanley Cup playoffs start in a month. Alexander Ovechkin, though, is hoping to have something to say about his participation, while fellow Russian Ilya Kovalchuk's postseason chances are minimal at best. Ovechkin hopes to get the Washington Capitals closer to a playoff spot Friday when they host Kovalchuk and the Atlanta Thrashers. Ovechkin, who leads the NHL with a career-high 56 goals and 97 points, is four goals shy of becoming the first player to reach 60 in a season since Mario Lemieux (69) and Jaromir Jagr (62) for Pittsburgh in 1995-96. The 22-year-old Ovechkin has been sizzling of late, scoring eight goals and adding seven assists in his last seven games, including a five-point performance in a 10-2 win over Boston on March 3. He has helped the Capitals (33-30-8) get within five points of Philadelphia for the eighth and final playoff spot in the Eastern Conference. 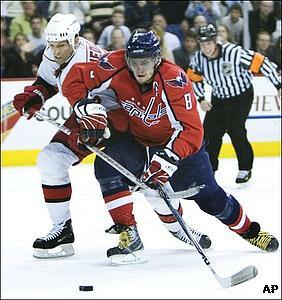 His play has even forced the Caps' local television station to showcase him on his own channel, where fans can see a split screen of game action and a camera dubbed "OvechKam," which is fixated on the superstar. The new feature debuted Wednesday and Ovechkin didn't disappoint, scoring two goals, including the game-winner with 1:54 to play in regulation in a 3-2 win over Calgary. "I don't think about OvechKam," Ovechkin said. "For me it doesn't matter, OvechKam or different camera." His impact on the team isn't lost on his teammates, particularly goaltender Olaf Kolzig, who made 24 saves to win his 300th game Wednesday. Ovechkin has 17 goals and as many assists in 22 career games against the Thrashers (31-33-8), but the Capitals have won only two of six meetings this season (2-2-2). They dropped the last matchup 3-2 in a shootout at Atlanta on Feb. 13, despite a goal and an assist from Ovechkin. Kovalchuk was held pointless in that contest after tallying eight goals and 12 assists in the previous 12 matchups. The All-Star left wing is second to Ovechkin with 48 goals, four shy of his career best set two seasons ago. He had his third hat trick of the season and an assist to help the Thrashers overcome a three-goal, second-period deficit in a 6-4 victory over Calgary on Thursday. Atlanta, though, is nine points behind the final playoff spot with 10 games to go. "It was tough. We were down three goals but we came back and showed a lot of character," Kovalchuk said. "It was good (to get the hat trick) but most importantly to win." Kovalchuk has been getting some help lately from right wing Colby Armstrong, who has three goals and an assist in the last four games. The scoring spurt comes after he managed only two assists in his first four games with the Thrashers since being acquired in a five-player trade that sent Marian Hossa to Pittsburgh on Feb. 26.